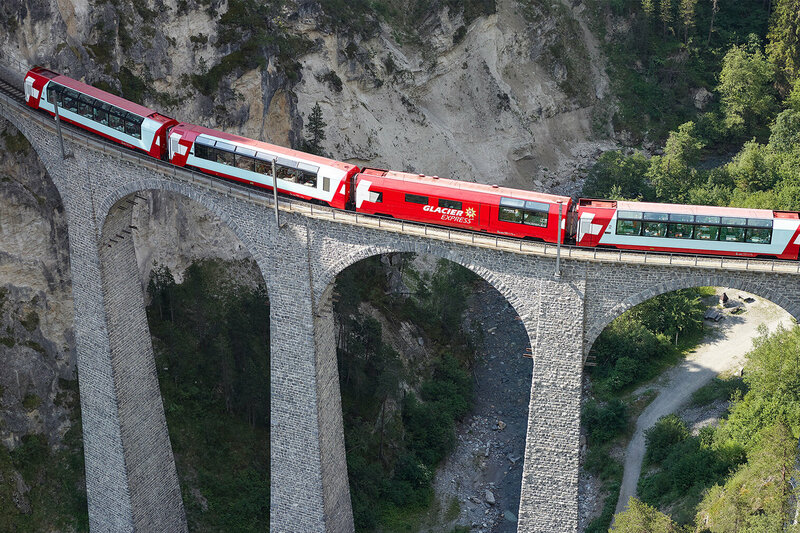 The Glacier Express train line is a classic when it comes to panoramic trips in Switzerland. 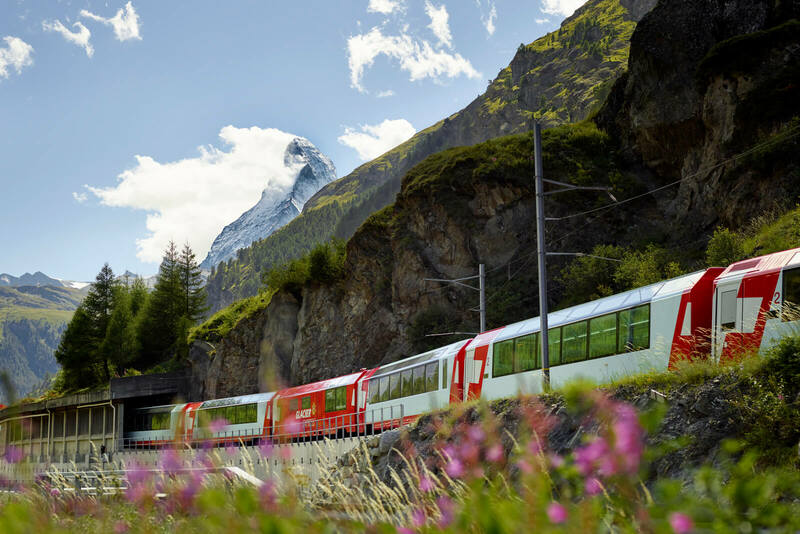 Many have heard of this scenic train ride between Zermatt and St. Moritz. It is a journey that begins at the foot of the Matterhorn and ends in the valley of lakes, the Engadine. Along the way, the iconic red train will cross no less than 291 bridges and pass 91 tunnels. Granted, there are faster ways to travel between Zermatt and St. Moritz. But certainly, riding a car is nowhere close to as attractive as riding a train. The Glacier Express train line offers many noteworthy highlights, such as the highest point of the route, the Oberalp Pass. At 2033 meters above sea, this alpine pass can only be climbed thanks to the train’s rack and pinion technology. Several times a day, the Glacier Express train will wind its way past idyllic mountain villages and rugged rock faces. The panoramic windows offer unrestricted views of the deep gorges, remote valleys, glaciers and the Rhine Gorge. The latter is so spectacular, it carries the nickname of “Swiss Grand Canyon”. Another highlight is the 142-meter long and 65-meter high Landwasser Viaduct. 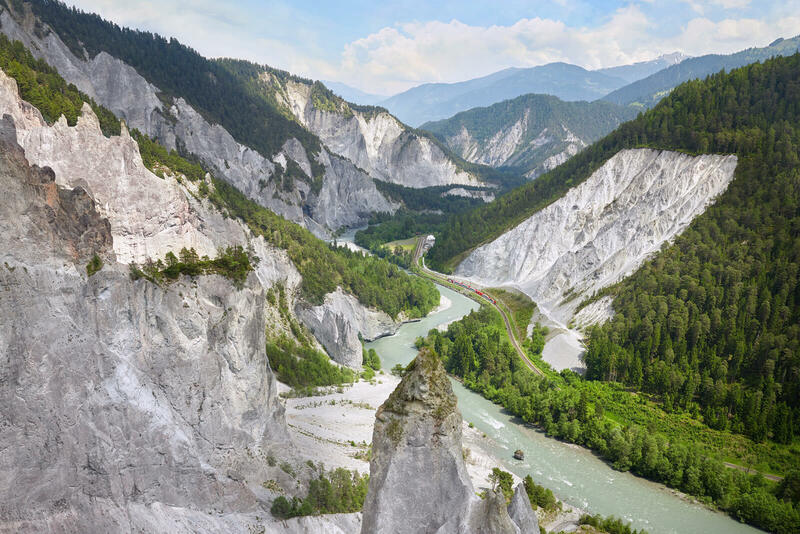 This impressive structure on five mason pillars allows the train to cross over an awe-inspiring gorge and straight into the Landwasser Tunnel. Crossing this viaduct is truly a must for all railway fans – it offers adventure and beauty! From Thusis, the Glacier Express will climb up the Albula Valley towards St. Moritz. There is a series of helical tunnels and yet more viaducts. Harmoniously embedded in the landscape, the Glacier Express line is a monument to the pioneering days of railway building. 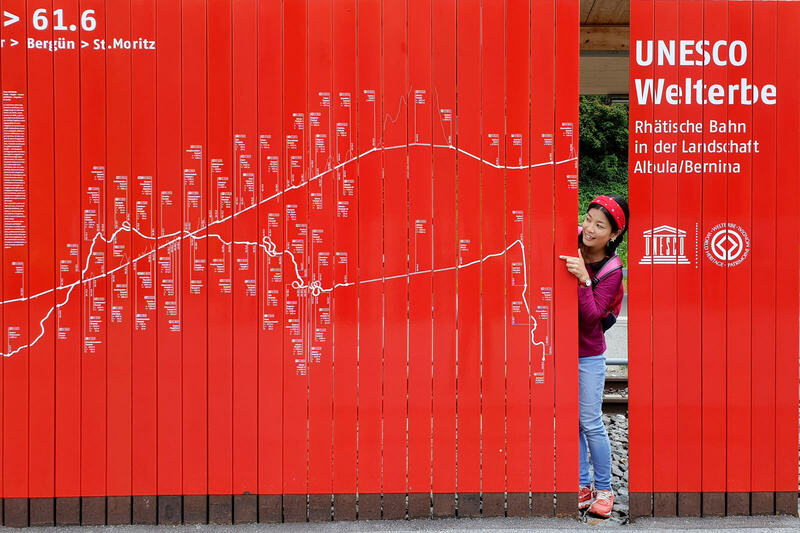 Also, it is part of the UNESCO World Heritage site “Rhaetian Railway in the Albula/Bernina Landscapes”. Given that the entire journey takes close to eight hours, it is good to know that there is onboard catering provided by the train’s kitchen. The food is actually served to the seat – a luxury treatment. 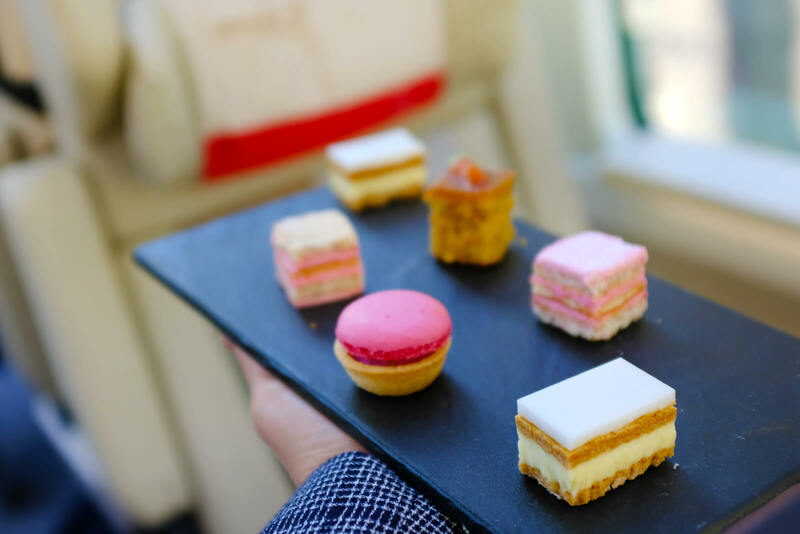 Whether you decide to indulge in a three-course meal or something from the à la carte menu, we can recommend the dishes as they are of really high quality. Since March, the panoramic trip through the Swiss Alps has become that much more spectacular. 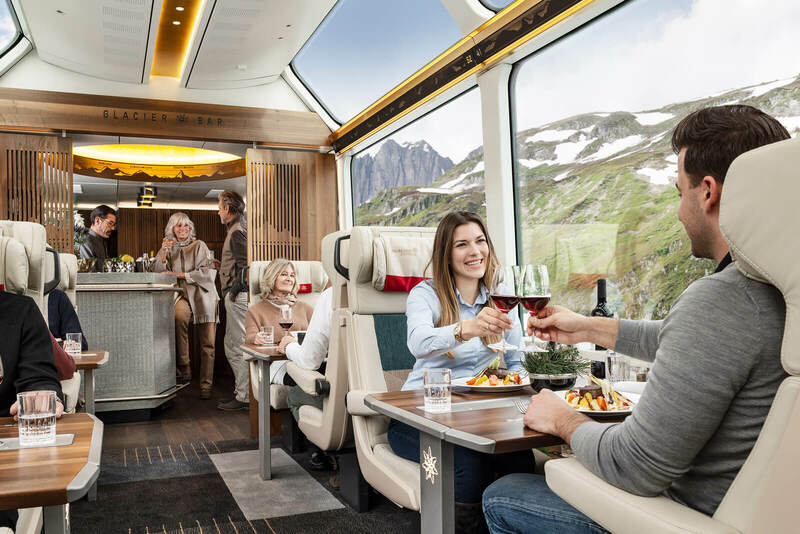 The new Excellence Class by Glacier Express sets standards that are as high as the mountain peaks along the legendary route. Or in other words: it is a train coach equipped with materials that are commonly found in private jets or luxury yachts! Those travelers with a reserved seat in this luxury coach will get to enjoy the highest level of comfort. Think adjustable leather seats, a personal iPad guide, the best views and even a five-course gourmet meal with wine pairing… Did we mention the Glacier Bar in the back of the wagon? Thanks to a golden compass on the ceiling, you will always know which direction you are headed. Since this luxury train coach provides the utmost space per passenger, each guest has a guaranteed window seat with wide panoramic views. Throughout the trip, train personnel are there to serve their privileged guests. Frankly, when we tried the Excellence Class, the amuse-bouche and the champagne tasted twice as good with the beautiful Swiss landscape passing by… The entire experience in the Glacier Express Excellence Class is a feast for the senses and one of the most exclusive touristic highlights in Switzerland. The steep Matter Valley offers an incredibly varied landscape: eternal ice, deep gorges, jagged rock faces, blooming alpine meadows, historical bridges, the highest vineyard and the highest soccer field in Europe. The Bies glacier is just outside the village of Randa. In 1991, millions of cubic tonnes of rock tumbled to the valley floor from the opposite side of the valley, changing the landscape forever. The town of Brig is well known for the impressive Stockalper Palace dating back to the 17th century. Apart from that, Brig is also the starting point for some magnificent hikes into the area of the massive Aletsch Glacier which has been a UNESCO World Heritage site since 2001. Goms is very popular for hiking in the summer and for cross-country skiing in the winter. The traditional wooden houses on wooden stilts form the perfect background. The legendary hotel pioneer César Ritz (1850-1918) is a native of Niederwald where he is also resting in peace. Andermatt was founded in the 12th century by the Walser people and is the starting point of various alpine passes. Numerous celebrities have taken a break here on their travels between northern and southern Europe. 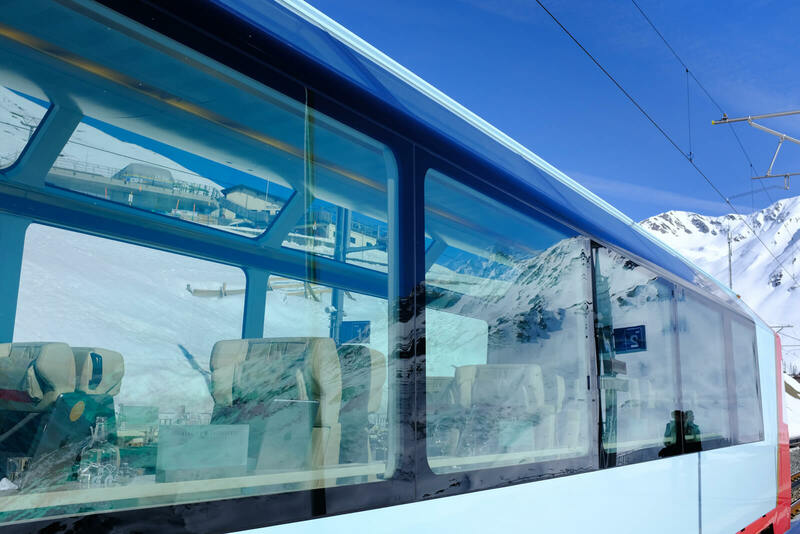 With the opening of the Andermatt Swiss Alps resort next to the existing village, this stop on the Glacier Express is being turned into an all-year destination. The Oberalp Pass at 2033 meters above sea level is the highest point of the journey. It is a border in several respects: a watershed between the rivers Rhône and Rhine, as well as a division between the cantons of Valais, Uri and Grisons. As the Glacier Express crosses the valley, it will the village of Disentis. The village is dominated by the monumental abbey and is home to the largest Romansh speaking community in Switzerland. Before the Glacier Express arrives in Chur, the oldest town in Switzerland, it will travel alongside the Rhine Gorge. Ten thousand years ago, during the Ice Age, the Rhine forced its way through the rocks and created this unique gorge with its bizarre rock formations. There are lots of castles and fortifications to be seen in the Domleschg. These fortifications were built in ancient times to control the Alpine passes. In the Albula Valley, you will pass the UNESCO World Heritage site “Rhaetian Railway in the Albula/Bernina Landscapes”. Overcoming the 418 meter difference in altitude required some incredible railway engineering. 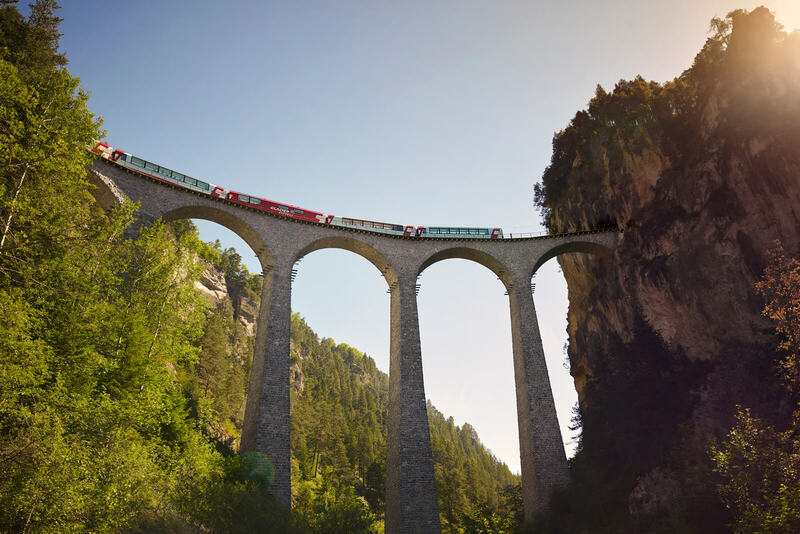 The most spectacular constructions are the Solis Viaduct (89 m height, 42 m length) and the famous Landwasser Viaduct, as well as the helical tunnel between Bergün and Preda where the new Albula Tunnel is currently being built. After almost eight hours, the Glacier Express will reach the Engadine with its rustic graffiti houses and the elegant holiday resort of St. Moritz. To mark the occasion of the 90th anniversary in 2020, all panoramic cars will be overhauled between 2019 and 2021. The Glacier Express will get an entirely new interior design as well as a state-of-the-art infotainment system. Amateur photographers can also look forward to an exciting change: it will be possible to open the windows in the bar car, as well as on the doors. This will make it possible to capture even more stunning shots without the glare of the windows!